This article may contain outdated information that is inaccurate for the current version of the game. It was last updated for 1.1. Tibet is the traditional homeland of the Tibetan people as well as some other ethnic groups such as Monpa, Qiang and Lhoba peoples and is now also inhabited by considerable numbers of Han Chinese and Hui people. Tibet is the highest region on Earth,The highest elevation in Tibet is Mount Everest, earth's highest mountain rising 8,848 m (29,029 ft) above sea level. Tibet borders China to the east Bhutan,British Raj,and Nepal to the south,Sinkiang to the north,and Xibei San Ma to the northeast. After the Xinhai Revolution (1911–12) toppled the Qing dynasty and the last Qing troops were escorted out of Tibet, the new Republic of China apologized for the actions of the Qing and offered to restore the Dalai Lama's title. The Dalai Lama refused any Chinese title and declared himself ruler of an independent Tibet. In 1913, Tibet and Mongolia concluded a treaty of mutual recognition. For the next 36 years, the 13th Dalai Lama and the regents who succeeded him governed Tibet. During this time, Tibet fought Chinese warlords for control of the ethnically Tibetan areas in Xikang and Qinghai (parts of Kham and Amdo) along the upper reaches of the Yangtze River. In 1914 the Tibetan government signed the Simla Accord with Britain, ceding the South Tibet region to British India. The Chinese government denounced the agreement as illegal. When in the 1930s and 1940s the regents displayed negligence in affairs, the Kuomintang Government of the Republic of China took advantage of this to expand its reach into the territory. Emerging with control over most of mainland China after the Chinese Civil War, the People's Republic of China incorporated Tibet in 1950 and negotiated the Seventeen Point Agreement with the newly enthroned 14th Dalai Lama's government, affirming the People's Republic of China's sovereignty but granting the area autonomy. Subsequently, on his journey into exile, the 14th Dalai Lama completely repudiated the agreement, which he has repeated on many occasions. Tibet starts with no National Spirits. 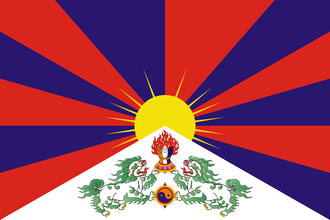 Tibet is counted as a minor nation and utilizes the generic national focus tree. Army Effort gives army experience and research bonuses to army research. Aviation Effort gives air experience, builds air bases, and research bonuses to air research. Naval Effort gives navy experience, builds naval dockyards, and research bonuses to navy research. Industrial Effort builds civilian and military factories (usually even if building slots are already full)and grants extra research slots. Political Effort gives the country choices on which political path they will take. As a Non-Aligned country, Tibet has a positive relationship with other Non-Aligned countries (+20) and a slight negative relationship with everyone else (-10). Tibet Starts with cores on china. Tibet begins without any alliances at the start of 1936. Tibet starts in 1936 with two research slots. It can gain two further slots from its National focuses - Extra Research Slot and Extra Research Slot II. Have a good strategy for Tibet? This page was last edited on 8 April 2019, at 12:59.